The School for Studies in Art and Culture: Music is pleased to welcome master percussionist Dong-Won Kim as the Artist In-Residence for Fall 2016. 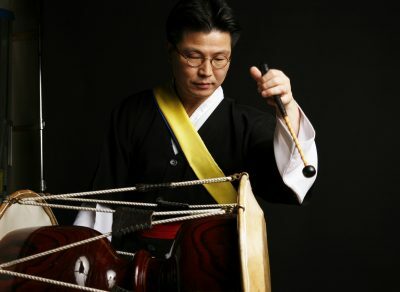 Over the last three decades, Dong-Won has studied various forms of traditional Korean percussion music including farmer’s drumming and dance, shamanic music, and Pansori accompaniment. He has performed throughout Europe, the U.S.A., Canada, Japan, and many other countries. He is a member of “The Silk Road Ensemble,” led by cellist Yo-Yo Ma, who describes Dong-Won as follows: “Every pore of his being is devoted to expressing the deep emotion he feels for traditional Korean culture. Its philosophy, physicality and spirituality are organic to Dong-Won’s art. It is an inspiration to make music with him.” Dong-Won has helped to forge new possibilities for Korean music, performing with many international musicians steeped in idioms including western classical music, jazz, and creative improvised music. In 1987, he was a political prisoner, sentenced for playing music at the funeral ceremony of Lee Seok-Gyu, who was killed by policemen in a pro-democracy protest against the Korean military dictatorship. From this experience, he thought more deeply about society and art. That was the turning point of his life; he began to study traditional music more profoundly as a search for the truest methods of communication and the expression of identity. As the Director of Research & Education for the Samulnori Hanullim Organization (1994-2004), he wrote teaching material about Korean traditional music, as well as children’s books, including The Story of Samulnori, a creative story about the origins of Samulnori, a genre of Korean percussive music. Dong-won also stars in the documentary film Intangible Asset Number 82 (2008), which has been screened around the world at many international film festivals and is the recipient of numerous awards including “Best Documentary of 2009” at the Durban International Film Festival. He is a practitioner in ‘Taepyongmu’ (the 97th Korean intangible cultural asset). Since 1996, he has been a visiting lecturer at the Basel Music Academy in Switzerland. At present he is an associate professor at Wonkwang Digital University, Korea. In 2014, he was the improviser-in-residence through the International Institute for Critical Studies in Improvisation in Guelph, Canada.